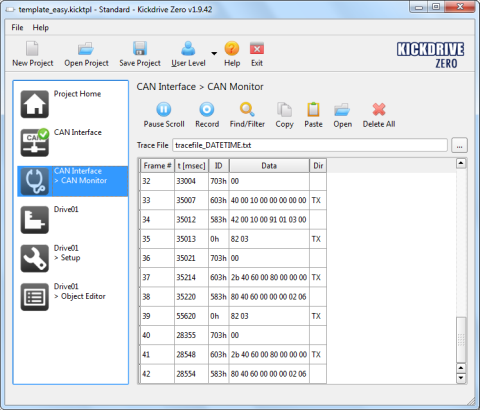 Kickdrive Zero is a simple CAN/CANopen configuration tool for fullmo servo drives, but it is also a great tool for any third-party CANopen or CAN application. Kickdrive Zero is the free entry-level edition of fullmo Kickdrive and provides a basic subset of fullmo Kickdrive's functions and features. Kickdrive Zero is Freeware - copyrighted software which is provided free of charge for both non-commercial and commercial uses. However, it is not a demo or evaluation version. There are no usage limits, no nagging upgrade offers or web registration forms. Feel free to download and start using the software right now. And if you want to go one step beyond at a later point, we recommend to download a trial version of fullmo Kickdrive, and find out about what you can do with the real deal.